Cirkuskapellet spiller op (The Circus Orchestra Strikes Up). Marcia vivace 1:33 6,40 kr. Løverne (The Lions). Lento e pesante 1:28 6,40 kr. Danserinden (The Dancer). Allegretto 1:20 6,40 kr. Akrobaten (The Acrobat). Vivace 0:54 6,40 kr. Wienervals (Viennese Waltz ) (Pas de deux). Valse lento e rubato 1:15 6,40 kr. Dyretæmmeren svinger pisken (The Animal Tamer Wields the Whip). Furioso 0:52 6,40 kr. Scene and Danse triste. Lento doloroso 2:25 6,40 kr. Finale (Can-can and Marche triomphale). Molto vivace 2:41 6,40 kr. I. Allegro vivace 4:42 6,40 kr. II. Andantino – 3:07 6,40 kr. III. Rondo giocoso. Molto vivace 3:09 6,40 kr. Molto vivace 6:49 9,60 kr. Allegro moderato – Cadenza – 6:40 9,60 kr. Molto sostenuto – 3:27 6,40 kr. Tempo primo (Allegro moderato) 1:34 6,40 kr. Ravnen, han flyver om Aften (The Raven He Flies in the Evening). Lento doloroso 3:55 6,40 kr. Skæmtevise (Comic Ballad). Molto vivace 3:41 6,40 kr. Liden Kirstens dans (Little Kirsten's Dance). Andantino grazioso 2:07 6,40 kr. Hr. Ramund (Sir Ramund). Allegro non troppo 2:55 6,40 kr. To discuss eras of musical development we often resort to categorizing the composers of the period in question. For the simple purpose of gaining an overview, it may be highly practical to gather together, say, composers from the same generation, or those who are kindred spirits musically speaking. Danish music history offers many such groupings: for example, within a few years at the end of the 1890s a number of extremely important composers were born – Jørgen Bentzon, Knudåge Riisager, Flemming Weis, Ebbe Hamerik and Finn Høffding – and the beginning of the 1930s saw the birth of three com­posers who were to leave a strong mark on the musical landscape of the second half of the 20th century: Ib Nørholm, Per Nørgård and Pelle Gudmundsen-Holmgreen. Between these two groups we find three composers of nearly the same age, each of whom had a huge impact on Danish music in the period c. 1930-90s. They were Svend Erik Tarp, Herman D. Koppel and Vagn Holmboe. There is no doubt that, of the three, Tarp had the most trouble holding the field, and after his death in 1994 his name and his music fell into obscurity. But there are compelling reasons to usher Tarp’s music back into the limelight, in part because he was one of the most distinctive and prominent composers of his time, boasting a large and versatile body of work, and in part because the image many have of Tarp as the elegant and entertaining composer is far from the complete picture of the man. Svend Erik Tarp was born on 6 August 1908 in Thisted, Denmark, where his father managed the Thisted-Fjerritslev Railway. In 1911, when Tarp was just two years old, the family moved to Kolding, where Tarp’s father was hired to run private railways, so it was in Kolding that Tarp would spend his schooldays. Tarp graduated from Kolding Højere Almenskole (later Kolding Gymnasium) in 1927, and soon after began studying music at the University of Copenhagen; but in 1930 he was accepted at the Royal Danish Academy of Music, from which he graduated two years later. His teachers included Knud Jeppesen (music theory) and Rudolph Simonsen (piano). In 1933 and 1937 he travelled to study in Germany, Austria and Holland, and in 1936-40 he taught students at the Opera Academy of the Royal Danish Theatre. Until 1942 he also taught ear training, music history, and music theory at the Royal Danish Academy of Music. In 1941-45 Tarp taught at the Royal Danish School of Educational Studies and was employed at the University of Copenhagen in what is now known as the Department of Musicology. But as early as 1938 Tarp accepted a position at the institution to which he was to dedicate his administrative abilities: KODA, which works with the performance rights of Danish composers and music publishers. Tarp worked for many years with KODA on a consultancy basis, but from 1961 to 1974 he served as general manager. In addition, Tarp worked in 1956-62 as a musical adviser to the Danish Broadcasting Corporation DR, and for many years as an administrator at Edition Dania. Considering that Tarp, along with the above-named posts, also held a number of important board and committee positions in the Danish music world, it is easy to understand just how much of Tarp’s time was taken up by admini­strative work. Svend Erik Tarp’s increasing roles in music administration did not prevent him from composing. Besides a large number of piano pieces Tarp composed symphonies, concertos and other orchestral pieces as well as chamber music and music dramas. Among the last of these are two operas, The Faraway Princess, staged at the Royal Danish Theatre in 1953, and the TV opera 9.90 from 1962 as well as two ballets, The Dethroned Animal Tamer and The Shadow. Finally, Tarp wrote film music and made his contri­bu­­tion to the Danish song with several fine melodies: the best known are probably Her har hjertet hjemme (Here the heart is at home) and I de grønne skove (In the woodlands green) – both from 1940 and included in the supplement to the national song book Folkehøjskolens Melodibog in 1964. 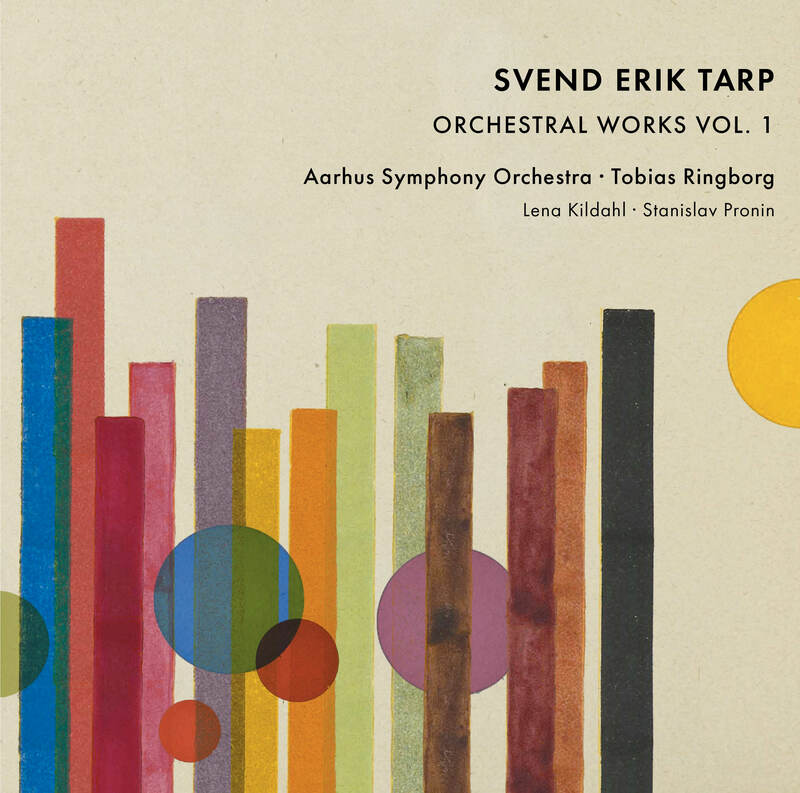 With this CD Dacapo begins releasing a number of selected orchestral works by Svend Erik Tarp. The first CD features early orchestral works composed in the years 1931-1942. They represent a fruitful period in Tarp’s production during which, not least under the influence of Igor Stravinsky, he developed the almost unmistakable neoclassicist style which has probably become one of his hallmarks, and which has made some of his works recent popular classics in Danish music. Many people have made the acquaintance of Tarp through his light, entertaining orchestral music, just as many have enjoyed playing his piano pieces; they are often rewarding to play even for amateurs, and it was in fact typical of Tarp that he made the effort to compose music that was accommodating both for the listener and the person who was to perform it. The elegant and easily accessible music, as mentioned above, is probably the best known, but not the only aspect of the composer. This CD features a number of works, a couple of which can be regarded as stages in a process of stylistic clarification on the way towards the said neoclassicism. The earliest of the works, Suite on Old Danish Folk Songs from 1933 - , was written by a young man with roots in Nordic Roman­tic music and a gaze discreetly oriented towards French Impressionism. The latter comes to expression not least in the beautifully sonorities and highly varied instrumentation that are characteristic of the suite. The first movement, “Ravnen han flyver om aften” (The raven he flies in the evening), is very delicately arranged with a cor anglais solo accompanied by ostinato viola figures and a restrained bass part in cellos and double-basses. In the second part the strings unfold in a sonorous texture but without any change in the almost ascetic accompaniment. In the second movement, which is based on a comic ballad melody, we find a lively style with sparkling accompanying parts. The intervening passage favours the woodwinds – quite typically for Tarp’s generation, by whom this instrument group was given brand new, important tasks, not least in a number of chamber music works. The strings are not forgotten, however, and at one point take over the role of the woodwinds, only to be united with the woodwinds before the return of the A-section. Ascetic is probably also the right term for the third movement, “Liden Kirstens dans” (Little Kirsten’s Dance), while in the fourth and final movement, which is based on the ballad of “Sir Ramund”, Tarp lets the trumpet lead the way in the almost processional setting of the ballad melody. The Concertino for violin and orchestra - is end-dated 17 May 1932. It was given its first per­formance at a concert of the Young Composes’ Society on 20 February 1933 with Svend Christian Felumb conducting. The soloist was Christian Esbensen, who a few years later, in 1937, became the solo violist in the Danish Radio Symphony Orchestra. The concertino is arranged in one continuous sequence which begins with a Baroque-like first subject, followed by a lyrically beautiful second subject. This is followed by several cadenza-like violin passages; only after a repeat of the first subject does the true solo cadenza follow. After a coda based on the first subject comes an extended middle passage where the violin develops a fine, simple melody line. As accompaniment one notes among other things small melodic figures in triplet motion in the trumpets, and quaver and semiquaver motion in the two saxophones. The first subject now returns and brings the work to its conclusion. The Concertino demon­strates a fine balance between restrained Romantic expression and at some points a more insistent 1930s style with a brittle rhythm where the Neue Sachlichkeit and a decided modernism rear their heads. Among the works of Tarp that were played frequently for many years, two comedy overtures must be mentioned, the first of which, performed here , is from 1940. These are well-written, charming hits in which Tarp’s supple rhythms and decidedly lyrical temperament form a fine unity. Tarp does not refrain from the great, almost Romantic gesture – specifically, in the second subject – but is able to incorporate it in the finely honed musical progression. With his Concertino for flute and orchestra from 1937 - Tarp seems to have arrived at least at a provisional stylistic clarification. Whereas the Concertino for violin reflected some of the stylistic diversity that typified the years at the beginning of the 1930s, the Concertino for flute is a rigorous work in an almost consistently neoclassical – here more specifically neo-Baroque – style. It is not neo-Baroque in Knud­åge Riisager’s sense, where the strict polyphonic aspect may sometimes seem to burden the texture. With Tarp the elegant expression takes pride of place – it is truly music without rough edges. Although in some places Tarp uses imitative passages, in the work in general one finds a very free treatment of them and of the motifs. Some of the material in the first movement also has a relatively undefinitive character, allowing both the thematic material and the accompaniment to be changed almost imperceptibly, so that it becomes a simple matter make easy transitions along the road. The plot summary excellently conjures up the picturesque milieu in which the ballet takes place, and this is underscored by Tarp’s sparkling music; one must also presume that with its illustrative qualities it kindled the spirits of the audience. In between the energetic, rhythmically inciting movements such as “The circus orchestra strikes up” and “The animal tamer wields the whip” Tarp has placed some more introverted numbers which, not least because of their instrumentation, have a parti­cular effect. This applies to “The lions”, where the cor anglais is prominent, as it was in the “Sir Ramund” ballad of the Suite on Old Danish Folk Songs, where it played a characterful melody to an ostinato accom­pani­ment, first in the violas and then in the celli. But in The Dethroned Animal Tamer the effect is much more ‘dangerous’ with the low fifths as accompaniment. In “Scene and Danse triste” one again notes the exquisite instrumentation, which in this case points in the direction of Maurice Ravel. Finally, Tarp gives the movement “The Dancer” extraordinarily elegant expression. While, as we have seen, the ballet had a short life on the national stage – it was only per­formed sixteen times and has not been revived since – the suite of the music recorded here survived as a frequently performed work, for example on Danish Radio. Six of the dances also live on as part of Tarp’s piano work Circus. 10 small piano pieces for two and four hands, op. 47, which were published in 1947.